Most students who enter colleges need basic math skills to succeed in college-level mathematics. Therefore, most colleges provide “a sequence of developmental mathematics courses that starts with basic arithmetic, then goes on to pre-algebra, elementary algebra, and finally intermediate algebra, all of which must be passed before a student can enroll in a transfer-level college mathematics course” (Stigler, Givvin, & Thompson, 2013, p. 1). Due to the rapid growth of technology, many colleges have increased offerings of online developmental mathematics courses in order to meet student needs (Jones & Long, 2013). Previous research (Bonham & Boylan, 2011; Cafarella, 2013; Jones & Long, 2013) shows that students who take either online or face-to-face developmental mathematics courses obtain an equivalent quality of learning as measured by final course grades, while students who take online developmental mathematics courses have higher retention and success rates than students who take face-to-face courses. However, there have also been negative findings from online developmental mathematics courses, attributed mainly to a lack of social presence in online learning environments. Bonham and Boylan (2011) point out that students who take online developmental mathematics courses are more likely to have low self-confidence and high math anxiety than students who take face-to-face courses. Cafarella (2013) also argues that there is more concern about student frustration in interacting with their instructor and course materials in online courses than there is in face-to-face courses. It is especially challenging for returning students who have not taken a math course in several years and who are not experienced with online learning to take developmental mathematics courses in an online format. Provide online orientation (e.g., a scavenger hunt) to help students fully understand all the online resources and tools that are used in the course and successfully interact with their instructor, classmates, and course materials. Provide optional weekly Q & A online sessions to help students articulate what they need help with, which is often challenging for the learner, and see that other students are struggling with similar problems. Provide self-assessment assignments to help students improve their error detection on math problems and establish problem-solving strategies. These assignments also help an instructor monitor students’ learning progress on each topic and provide appropriate instruction and feedback in a timely manner to improve student learning. Provide test review online workshops to help students prepare for their math tests and/or exams. Provide online small group activities so students can actively engage in group activities and discussions and help each other solve the math problems. Provide a teaching assistant or individual tutoring service, either online or face-to-face, to help students direct to their needs. Be familiar with and employ learning strategies to help alleviate mathematics anxiety, build self-confidence, and maximize student learning in mathematics. Provide constructive feedback in a timely manner. Consistently monitor student’s learning progress. Be familiar with new technology tools in the course. Encourage students to actively engage in class activities and communicate with their instructor. Pre-assess students’ math skill abilities and provide a situational assessment of each student’s confidence in her or his ability (e.g., ALEKS software). Create small units of instruction that include relevant examples and practices; assess students for mastery of each unit before progressing to the next one. Create instructional materials to achieve learning outcomes. Provide relevant multimedia and/or online resources (e.g., visual aids, videos, simulation, animation, cartoons, etc.) to practice for complex, difficult topics and problems. Clearly locate relevant ancillary or supplementary materials every week (e.g., lecture videos, examples, worksheets, quizzes, study guides, etc.). 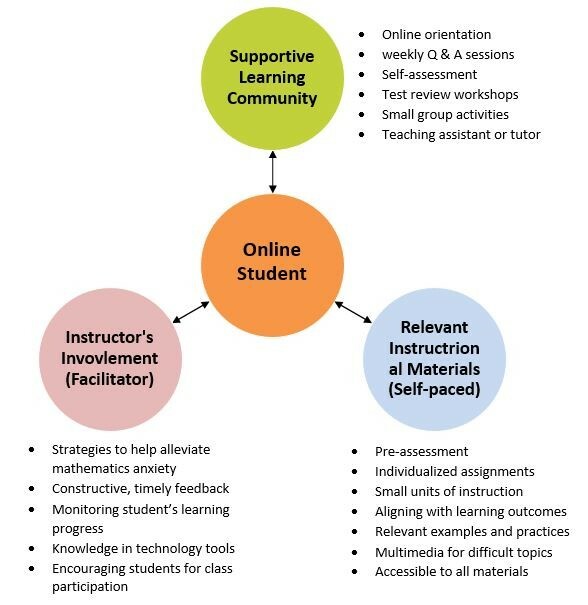 Online courses present some unique challenges for students taking developmental mathematics courses, especially when it is the student’s first experience in a totally online learning environment. Every student is different, and as a result, there is no perfect, one-size-fits-all instructional practice in mathematics. However, if we understand our students’ barriers in an online learning environment and appropriately employ instructional principles to this unique learning context, we can improve the quality of online developmental mathematics courses and better help our students succeed. These instructional principles can also be applied to developing and teaching other online development courses such as writing courses. As stated above, a great deal of research has found that the delivery of developmental mathematics instruction in an online format has helped to increase student success and retention. Last year, a math professor and I applied the three key principles identified above to develop an online developmental mathematics course. The results of the course also support these findings—students achieved high performance in terms of their grades and were very satisfied with their online courses. A subsequent blog post will discuss the application of best practices in the design of an online developmental mathematics course and present evidence of its effectiveness. Ashby, J., Sadera, Q., & McNary, S. (2011). Comparing student success between developmental math courses offered online, blended, and face-to-face. Journal of Interactive Online Learning, 10(3), 128-140. Bonham, B. & Boylan, H. (2011). Developmental mathematics: Challenges, promising practices, and recent initiatives. Journal of Developmental Education, 34(3), 2-10. Cafarella, B (2013). Exploring best practices in developmental mathematics (Doctoral dissertation). University of Dayton, Dayton, Ohio. Jones, S. & Long, V. (2013). Learning equity between online and on-site mathematics courses. Journal of Online Learning and Teaching, 9(1), 1-15.